In two short days we will be celebrating our 33rd Annual I Love America Summer Celebration! Over the past thirty-three years Vestavia Hills has seen lots of change come from this highly anticipated event. In the midst of change though, our key component still remains: a celebration of our country and community. In years past we have done a few summer celebrations dispersed throughout the summer. However, this year we decided to collaborate the two to make it one grand event. And grand it is! This year will feature the largest amount of sponsors to date, a live orchestra, children’s activities, free swimming and a business-expo with tons of free goodies… what could be better? Perhaps watching one of the most popular animated films of the year (and most likely to date) that will guarantee to make you a little cooler in this hot and humid weather! As the sun goes down we will begin Disney’s animated movie Frozen, scheduled to be shown at 8:15p.m. We look forward to another successful year (with hopes of NO rain!) for Vestavia Hills to come together for love of country and community. 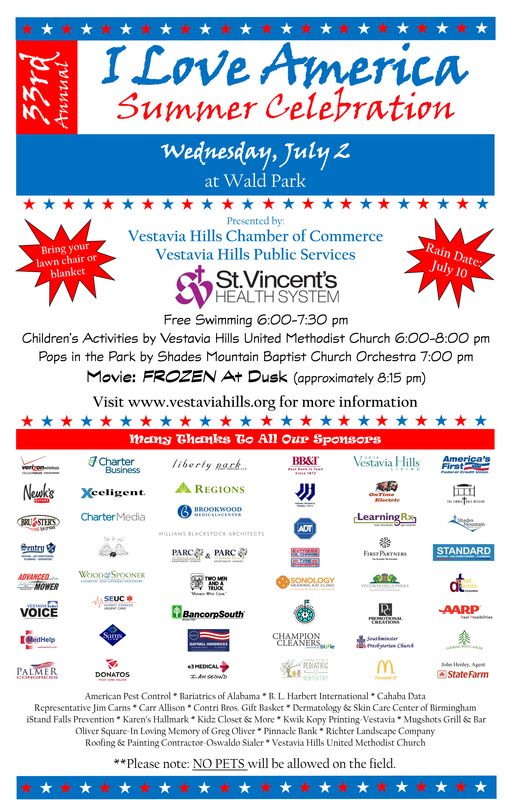 The event is Wednesday, July 2, starting at 6:00 p.m. at Wald Park in Vestavia Hills (located near the Vestavia Hills Civic Center and West Elementary School). Children’s Activities provided by Vestavia Hills United Methodist Church will be open from 6-8 p.m. Shades Mountain Baptist Orchestra Pops in the Park will be starting at 7 p.m. The park will be filled with tents for our Business Expo from our Gold Sponsors. Free goodies and informative booths will be set up from 6-8 p.m.
Disney-animated hit Frozen will be played at dusk around 8:15 p.m.
Only regular Wald Park pool members will be admitted before 6 p.m.
Children under the age of 10 must be accompanied by an adult at the pool. Pets are not allowed on the fields in Wald Park. Soft drinks and food will be available upon purchase. IF it does rain, Pops in the Park will hold their concert at Shades Mountain Baptist on Wednesday, July 2, 7:00 p.m. IF it does rain, our I Love America rain date will be: Thursday, July 10. Gold: AARP, ADT Security Services, Advanced Mower, Alliance Publishing Group, America’s First Federal Credit Union, BancorpSouth, BB&T, Brookwood Medical Center, Bruster’s Real Ice Cream, Cahaba Heights Pediatric Dentistry, Cellular Sales Authorized Agent of Verizon Wireless, Champion Cleaners, Charter Business, Charter Media, Cooking with Cancer, Demarco for Congress. Digital Trends, Donatos, Drs. Wood & Spooner, e3 Medical & I Am Second, Express Oil Change & Tire Engineers, First Partners Bank, Gary Palmer for Congress, Jackson Howard & Whatley CPAs, Kulture City, Learning Rx, Liberty Park Joint Venture, McDonald’s, MedHelp Clinics, Newk’s Eatery, OnTime Service, Parc at Grandview and Parc at Cahaba River, Promotional Creations, Re-Elect Gaynell Hendricks Jefferson County Tax Assessor, Regions Bank, Sam’s Club, Sentry Heating, Air, Plumbing & Generators, Shades Mountain Baptist Church, Sonology Hearing Aid Clinic, Southminster Presbyterian Church, Standard Heating & Air Conditioning, Starnes Publishing, State Farm Insurance- John Henley Agency, Summit Express Urgent Care, The Jimmie Hale Mission, The Lili Pad, TWO MEN AND A TRUCK, Vestavia Hills Parks & Recreation Foundation, Williams Blackstock Architects and Xceligent. Silver: American Pest Control, B.L. Harbert, Bariatrics of Alabama, Cahaba Data, Carr Allison, Contri Bros. Gift Basket, Dermatology & Skin Care Center of Birmingham, iStand Falls Prevention, Karen’s Hallmark, Kidz Closet & More, Kwik Kopy Printing-Vestavia, Mugshots Grill & Bar, Oliver Square Vestavia-ln loving Memory of Greg Oliver, Pinnacle Bank, Representative Jim Carns, Richter Landscape Company, Roofing & Painting Contractor- Oswaldo Sialer and Vestavia Hills United Methodist Church. Visit www.vestaviahills.org or call (205) 823-5011 if you have any questions! We hope to see you there!